We are excited to announce a new kind of MTB coaching – Training Squads! MTBers are generally self-sufficient, independent cyclists. Yet, when we hosted Camp Lynda the shared excitement was palpable. Everyone benefited but only for 3 days. A Training Squad is a group of athletes targeting the same event. Squad members work towards nailing their event goals while motivating each other along the way. Coaching keeps you on track and eliminates the guesswork. Coaching – we pick apart the demands of a particular event and create training plans to target those demands. Training via TrainingPeaks, on and off the bike training included. A private forum to get answers to coaching questions from coaches Lynda Wallenfels and Dave Harris. Strava club and Facebook group for each squad as a place to encourage, meet, or heckle squad-mates. 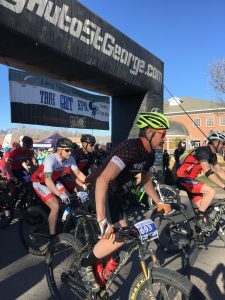 Our first Training Squad targets the True Grit 50 in St George, Utah. Training starts November 10 and the race is March 10. Read more about the squads at https://lwcoaching.com/trainingsquad and the True Grit squad here. We are considering Training Squad events for 2018. Request your event at https://lwcoaching.com/trainingsquad/request-an-event/!